This headband can be worn in many ways. It's sometimes called a hair-wrap and can be worn as a wide headscarf or a skinny headband. This simple to sew headband features one area that has encased elastic, while the other area can stay pleated or bunched to wear as a skinny headband. It can also be pulled out flat to cover most if not all of the head, like a head scarf. It's a great accessory that can be used with many different outfits. Since this headband does not require a lot of fabric and the fabric does not have to stretch, you can watch remnant and clearance racks, to sew yourself a headband to match every outfit or whim without breaking the bank. 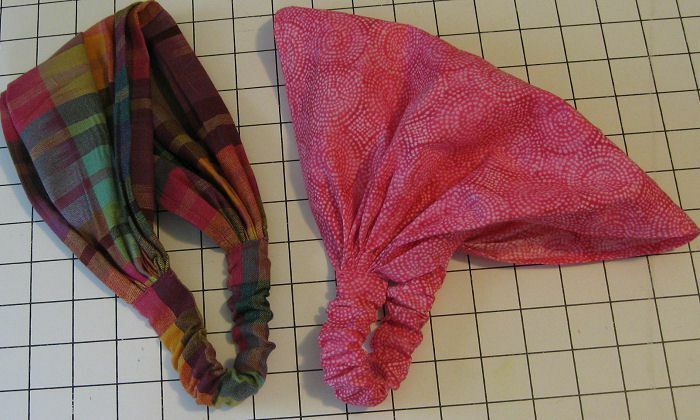 They're a great replacement for bandannas, so you don't knot your hair at the same time you try to tie the bandana. As they are so easy to make these headbands are a perfect gift for the long-haired people in your life. This headband is easy on your scalp and will not damage your hair. Using the 11-inch X 3-inch piece of fabric, with the wrong sides of the fabric together, align the 11-inch edges. Sew a seam along the 11-inch edge using a scant 3/8 inch seam allowance. Turn the tube right side out and press with the seam centered on one side of the tube. Thread the elastic into the tube, using a bodkin or safety pin, leaving the elastic ends exposed and the fabric tube bunched on the center of the elastic. Turn under again to enclose the raw edge and press in place. Stitch the 1/8 inch hem in place, sewing as close to the inner edge fold as possible. Pleat the 12-inch edge by making small fan folds until the 12-inch edge is 1 inch wide. Sew the elastic to the pleated ends of the wide section, keeping the seam side to the wrong side of the wider section. Turn the ends of the tube in approximately 1/4 inch to enclose the raw edges. Slide the folded under ends of the tube over the ends of the elastic and the basting stitches on to the pleated sections. Align the turned under edges so they are even. Sew across the turned edges to finish the headband.